EOLSS deals in detail with interdisciplinary and trandiscplinary subjects, but it is also disciplinary as each major core subject is covered in great depth, by world experts. One of the largest e-Books repositories on the Web, dedicated to the health, maintenance and future of the web of life on planet Earth, focusing on the complex connections among all the myriad aspects from natural and social sciences through water, energy, land, food, agriculture, environment, biodiversity, health, education, culture, engineering and technology, management, development and environmental security carrying knowledge for our times. It has been developed under the auspices of the United Nations Educational, Scientific and Cultural Organization (UNESCO). It is regarded as the world’s largest comprehensive professional publication carrying state-of-the-art, high quality, peer reviewed, thematically organized archival content in many traditional disciplines and interdisciplinary subjects with including the coverage of transdisciplinary pathways. The contributions are from thousands of scholars from over 100 countries and edited by more than 350 subject experts. It also includes up-to-date coverage of various aspects of sustainable development that are relevant to the current state of the world. If you are interested in marketing the EOLSS in your area, please Contact us. 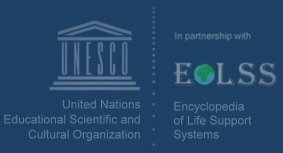 UNESCO-EOLSS is an integrated compendium of twenty one component encyclopedias, each covering a large number of disciplinary, interdisciplinary and transdisciplinary subjects. Are you searching for authoritative knowledge in Natural Sciences and Social Sciences in all their deep specializations, global issues such as climate change, sustainable development, etc? There are many sources of information on the internet in unmanageable numbers and diversity and often one is not sure of the quality and authenticity. Your time and effort can be mostly spent in searching the Internet for the right source for the subject of your interest. Here at www.eolss.net you are in the one place that will satisfy all your needs for authenticity, quality, breadth and depth of coverage with a choice among hundreds of subject areas and their interconnections. The EOLSS On-line is a virtual library in which you have everything that you need for all practical purposes. At the same time, the annotated bibliography in each chapter of the EOLSS On-line references other outside sources. The EOLSS On-line is always with you wherever you are and you can enter its enormous world of knowledge with the touch of a button and move through it with ease.